Home / Tiger Bounce House. Bring a sense of the wild to your next outdoor and indoor event or gathering with this stylish and colorful tiger jumper. This commercial grade bounce house is ideal for any event, offering hours of fun for attendees. It is created from the toughest, most durable vinyl material. A hip roof adds a bit of headroom inside, where young ones will find a 13’x13’x11’play area. Windows covered with finger-friendly fine mesh screen can be found on all four sides. 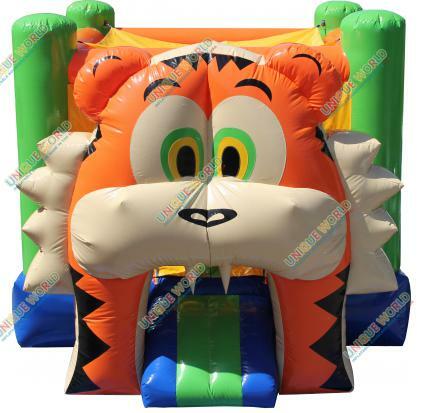 Just above the inflatable entrance ramp, a smiling tiger greets visitors, and the tiger theme continues with stylized stripes and paw prints on the front of the bouncer.